Author(s) Complete Test Preparation Inc.
Over 200 CBEST® practice questions, prepared by a dedicated team of exam experts, with detailed answer key, Math shortcuts, tips and tricks, tutorials and multiple choice strategies! CBEST® Practice Test Questions and Tutorials for: Arithmetic Basic Algebra Graphing Word Problems Fractions, Decimals and Percent And a lot more! Need to brush up on your math? This is the book for you! 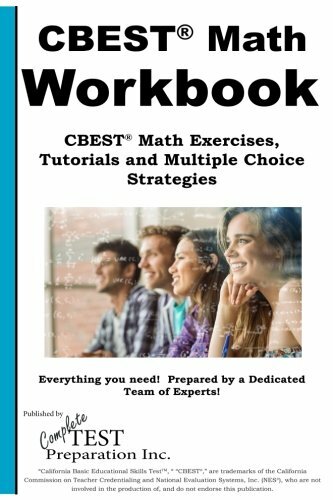 CBEST® Math practice questions, easy-to-read tutorials explaining everything in plain language, exam tips and tricks, math shortcuts, and multiple choice strategies! Everything you need, complied by a dedicated team of experts with everything you need all in one place! “California Basic Educational Skills TestTM, “ “CBEST®,” are trademarks of the Califor­nia Commission on Teacher Credentialing and National Evaluation Systems, Inc. (NES®), who are not involved in the produc­tion of, and do not endorse this publication. Here is what the CBEST® Math Workbook can do for you: Learn then practice your math skills! Practice test questions are the best way to prepare for an exam and this is the book that you need to fully prepare for the CBEST® math test. Practice Tests familiarize you with the exam format and types of questions, giving you more confidence when you take the exam. Practice tests are a critical self-assessment tool that reveals your strengths and weaknesses. Practice tests allow you to practice your exam time management – a critical exam-writing skill that can easily improve your grade substantially. Practice tests reduce Test Anxiety, one of the main reasons for low marks on an exam. Hundreds of questions with detailed solutions and explanations to improve your understand of the basic concepts behind the questions. Learn powerful multiple choice strategies designed by exam experts! Includes tips and multiple choice strategies to increase your score you won't find anywhere else! Practice Really Does Make Perfect! The more questions you see, the more likely you are to pass the test. And between our study guide and practice tests, you’ll have over 200 practice questions that cover every category. Our practice test questions have been developed by our dedicated team of experts. All the material in the study guide, including every practice question, are designed to engage your critical thinking skills needed to pass the test! Heard it all before? Maybe you have heard this kind of thing before, and don't feel you need it. Maybe you are not sure if you are going to buy this book. Remember though, it only a few percentage points divide the PASS from the FAIL students! Even if our test tips increase your score by a few percentage points, isn't that worth it?